Getting up Tuesday morning was not as hard as the past few days, because we had our free day ahead of us. We are happy to get to work every day regardless, however excitement was radiating off of everyone in the morning because of our trip to White Sands, New Mexico. The trip was a four hour drive to Alamogordo, New Mexico. The way down was filled with lots of great music, thanks to our wonderful copilots, and we took in the beautiful scenery around us. It was wild to see how the landscape changes throughout New Mexico, just from a short drive. We had lunch at Si Señor, a local Mexican restaurant, that was 20 miles from White Sands. Once we arrived at the national monument, we rented two sleds and drove to a location within the monument. On the drive in we didn't know what to expect because we just saw the sand dunes to our left, however pulling into the lot we were surrounded by never ending white sand. We all raced to the top, but immediately stopped and took in our surroundings. For miles and miles, there were thousands of white sand dunes, which was incredible. The sun was beating down on us, and in that moment we couldn't be more content. We spent a few hours at White Sands, running around and playing games. By 4pm we were all tired, and treated ourselves to ice cream. The drive back was relaxing and full of bonding. When we arrived at our community center, we were covered in sand and fighting for the showers. We made a late spaghetti dinner, eaten around 10pm. All of us are completely exhausted, but ready for another day of work tomorrow, which we are sure will be full of adventure. 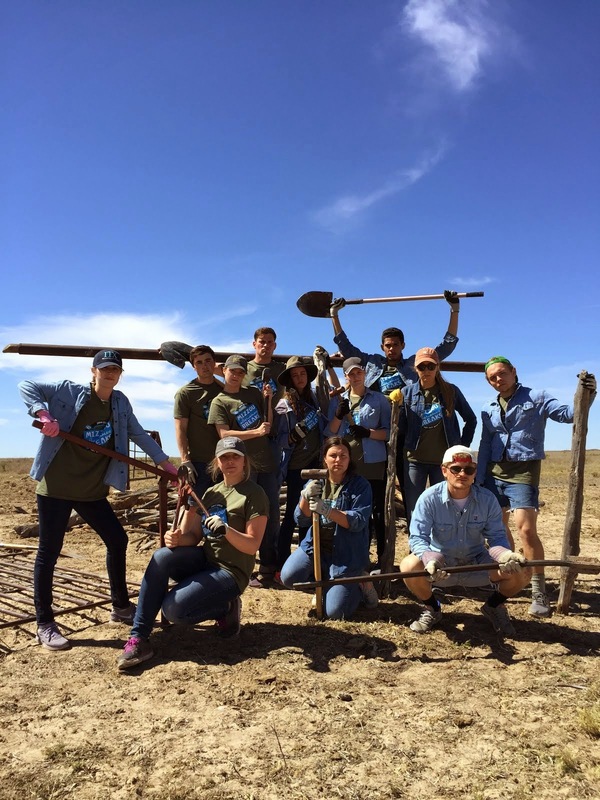 Yesterday we went to Texas and worked at Muleshoe National Wildlife Refuge. We took down several fencing structures that had once been used by a researcher from Chicago who was studying bees. We got to tour the refuge and ate lunch at picnic tables nearby. We were finished with our work in the early afternoon so we made a trip to downtown Muleshoe. After driving around we headed back to Milnesand where many of us took a nap. The few that stayed awake played frisbee and hung out in their hammocks outside. The wind picked up before dinner so we all headed in and made food together. It was great cooking in the kitchen, with everyone participating. It was a weird mix of vegetables, mac and cheese, bacon and pancakes, but it was delicious! Today was another day of waking up at 5:30am. We went out and surveyed ranches for prairie chickens, but unfortunately did not see or hear any. This is no surprise, as their population has been cut in half over the past year. Ranches that used to have prairie chickens are no longer seeing them as frequently as they have just recently become threatened. We came back to the community center and made breakfast and our lunches for the day. We headed out to the job site we were at on Sunday, continuing our tear down of the fences. We got a lot of it done today, and plan on finishing it tomorrow morning. 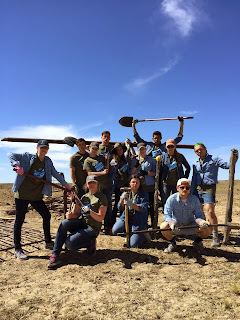 We took a few breaks, as demanded by our site coordinators - and one of the breaks was spent playing baseball with wooden posts as the bat and hard cow poop as the balls. We had an unforgettable day today, and are currently spending dinner with the same family that we did on Sunday. Betty and her family have been amazing to us, and their hospitality is out of this world. With only one day of service left, our time here is precious and we are all very sad to leave. We are so grateful for this entire trip and couldn't have asked for a better place to spend it at.